The General Assembly session starts Wednesday! Please join Delegate Steve Heretick (D-Portsmouth/Norfolk) at the Bier Garden located at 438 High Street on Sunday January 6th from 4:00PM-5:30PM for a meet and greet. The event will be FREE and is a good opportunity to speak with your Delegate before he heads back to Richmond to work for you in the upcoming General Assembly Session! Delegate Heretick has introduced HJ582 to implement non-partisan independent redistricting reform in Virginia. Contact your legislators today and ask them to co-sponsor this bill. It's time to put an end to gerrymandering once and for all! 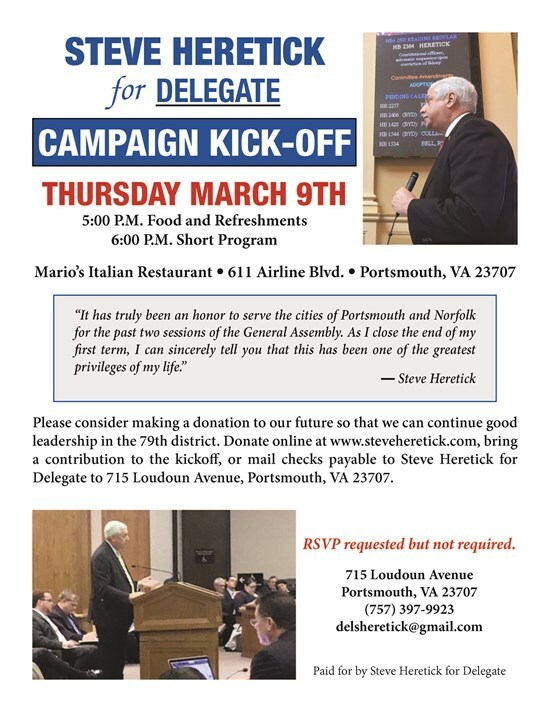 Delegate Steve Heretick will be hosting a fundraising reception on Sunday October 21st at Rajput Indian Restaurant in Suffolk (5860 Harbour View Blvd, A-1). The event is from 5:30-6:30 with food and drinks provided with a VIP Reception from 5:00-5:30. To purchase tickets CLICK HERE. The fundraising reception scheduled for October 12th has been postponed to October 21st from 5:30PM-6:30PM (VIP Reception 5:00-5:30) due to the potential flooding and other damage from Hurricane Michael. The event will be held at Rajput Indian Restaurant in Suffolk. To purchase tickets CLICK HERE. VA Democratic Delegate Steve Heretick rails against proposed gerrymandering by his own caucus' leadership. Delegate Heretick has introduced HJ582 which would establish a bi-partisan redistricting commission and prohibit the use of race, incumbency, and voting data in drawing legislative districts. Delegate Steve Heretick is once again standing up for independent non-partisan redistricting reform. HJ582 is a constitutional amendment protecting the current constitutional standards on population equality, compactness, and contiguity and adds additional standards to minimize splits of localities and to prohibit consideration of incumbency and political data. RICHMOND, Va. – The Virginia House of Delegates passed a bill proposed by Delegate Stephen E. Heretick (D-Portsmouth) that would automatically suspend any local or constitutional officer convicted of a felony. On Monday morning, House Bill 2364 passed the House 95-1 and now heads to the Senate. Is the battle to keep the Sports Hall of Fame in Portsmouth worth fighting? Del. Heretick, upon taking office in January, introduced HR73 a study to reduce or eliminate the tolls. The VA Department of Transportation is now studying the matter with a report due back by October 1, 2016.